This is a ground breaking translation of a major work which surfaced only in 1952. It claims to be by S’ankara Bhagavatpada (700AD), India’s greatest philosopher and spiritual teacher. If accepted as authentic, which seems increasingly likely, it will transform S’ankara studies and parts of Indian philosophical tradition. There is a chapter on this text in Wilhelm Halbfass: Tradition and Relflection, which discusses the text and some main concepts, though not the yoga practices. It is a sub-commentary on the Vyasa commentary (about 500 AD) to the Yoga Sutras of Patanjali (about 200 AD). This text will entail a re-thinking of S’ankara and his presentation of the Advaita Non-dual doctrine and practice. In his Brahma Sutra commentary, S’ankara rejects two basic tenets of the Yoga school, but accepts yoga practice as authoritative for meditation, and indeed God-vision (sutra III.2.24). S’ankara’s Gita commentary has many of the technical terms of yoga as for instance samahita-citta (8 times); Madhusudana in his own later sub-commentary on the S’ankara, cites nearly all of the first 51 sutras of Patanjali’s Yoga Sutra first part. 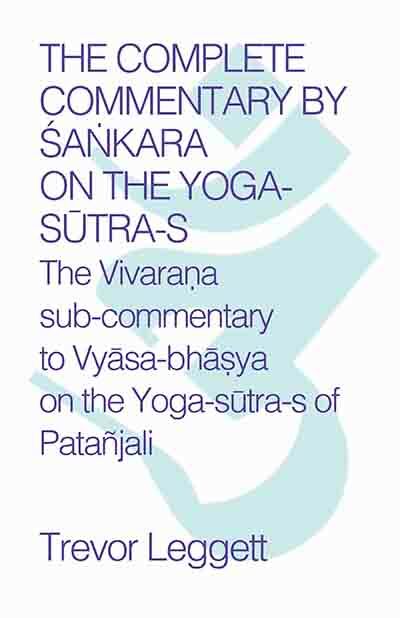 Here in this massive newly discovered text, S’ankara comments exhaustively on the Sutras and the early Vyasa commentary, both of which he glosses word for word. But as the translator illustrates in his Technical Introduction, S’ankara here swings the Yoga doctrine towards his own Advaita (as he does with similar semi-dualistic passages in the Gita) with copious citations from the Upanishads and the Gita itself. The text is brilliantly written, and shows marked originality of thought. For instance, there are over two hundred similes and analogies, some of them apparently unique to this work, and therefore of exceptional interest. He does not hesitate to modify the Vyasa commentary, and even the implied meanings of the sutras themselves, in order to introduce Advaitic concepts. The present work is the first complete English translation of a highly significant historical find, an unknown early Sanskrit sub-commentary purporting to be by Sankara, on the Yoga sutras of Patanjali. It is judged to be a genuine work of Sankara, India’s greatest riligious and philosophical genius and architect of the non-dual Vedanta school. This is a sub-commentary (vivarana) to the terse exposition of Patanjali by Vyasa, the earliest surviving classic of the Yoga school. That school differs from Sankara’s Vedanta on several philosophical points, but he regarded it as authoritative on meditation practice, which is central to both schools. The existence of this vivarana is of great importance to the study and reappraisal of Sankara’s thought and teaching. It is now clear that the many references in Sankara’s works to Yoga practice are not mere concessions to accepted ideas of the time, but that it was central to his practice. The vivarana is written with great originality and confidence. The long commentary on God completely jettisons the narrow sutra definition in favour of a supreme Creator, as evidenced by many ingenious arguments on the lines of the present day cosmological anthropic principle. The doctrine that the future already exists, and that time is purely relative, anticipate the Einstein era. This study consists of revised editions of Trevor Leggett’s two previous volumes, which presented Parts One and Two of the vivarana, and the new translations of Parts Three and Four. The complete work is thus published here for the first time. In the book, the Patanjali sutras (about AD 300) are accompanied by Vyasa’s commentary (about AD 540-650) and by the Sankara vivarana commentary (about AD 700) to allow full textual and philosophical comparison. As several reviewers have pointed out, the translation has been kept lucid and fully understandable for the general reader. It is important not merely academically but as an authoritative guide on meditation. …We are happy to have the first complete translation of this important work…. It is a pleasure indeed to go through the lucid English translation…There are some critical points to be made, but of only minor nature. We heartily congratulate Mr. Leggett on his success in bringing out the first faithful and lucid translation of this difficult text. The Technical Introduction gives the author’s textual analysis of the shifting positions of S’ankara and other commentators on the Yoga Sutra, as well as correspondences with his Bhagavad Gita commentary and some further arguments in favour of S’ankara’s authorship…. …translation itself is very readable as far as the difficult subject allows; its lucid style being no doubt the result of the author’s thorough acquaintance with the subject-matter; not only theoretically, but also practically through his own meditational practice, a rare combination of unbiased scholarship and personal involvement.